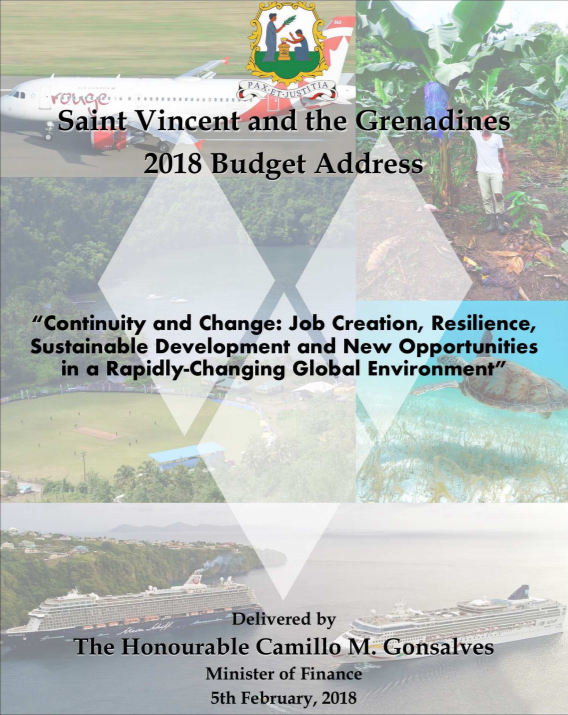 2018 2018 Budget Address: Continuity and Change: Job Creation, Resilience, Sustainable Development and New Opportunities in a Rapidly-Changing Global Envivornment. Delivered by The Honourable Camillo M. Gonsalves, Minister of Finance. 5 February 2018. 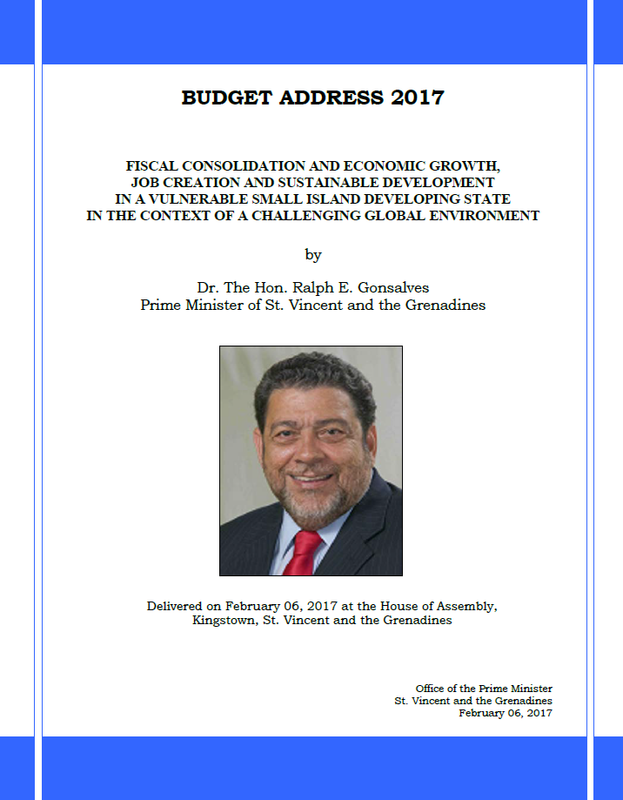 2017 2017 Budget Address: Fiscal Consolidation and Economic Growth, Job Creation, and Sustainable Development in a Vulnerable Small Island Developing State in the Context of a Challenging Global Environment. Delivered by Dr. The Honourable Ralph E. Gonsalves, Prime Minister and Minister of Finance. 6 February 2017. 2016 2016 Budget Address: Economic Growth, Job Creation, Zero Hunger, and Fiscal Consolidation Amidst Global Uncertainty Continuing. Delivered by Dr. The Honourable Ralph E. Gonsalves, Prime Minister and Minister of Finance. 22 February 2016. 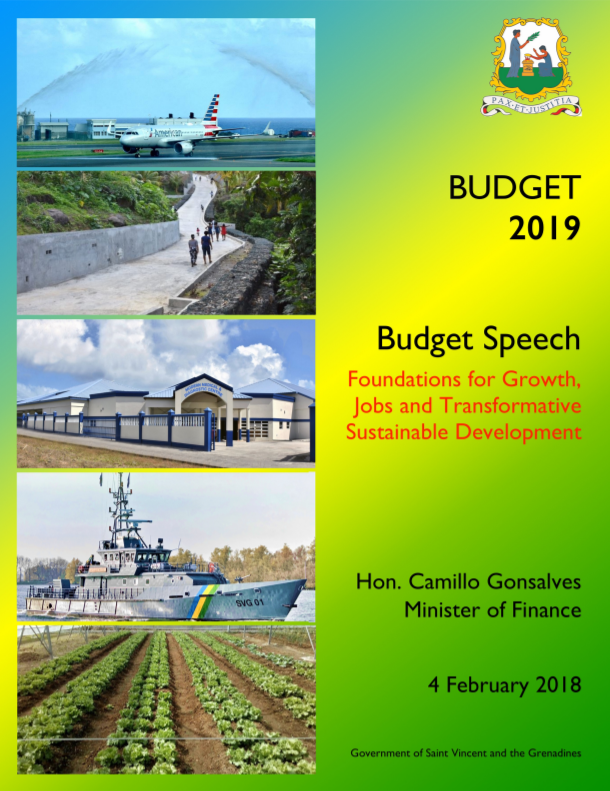 2015 2015 Budget Address: Continuing the Quest for Wealth and Job Creation, Equity, Resilience, and Fiscal Consolidation in a Small Multi-Island Economy in the Midst of Exogenous Challenges. Delivered by Dr. 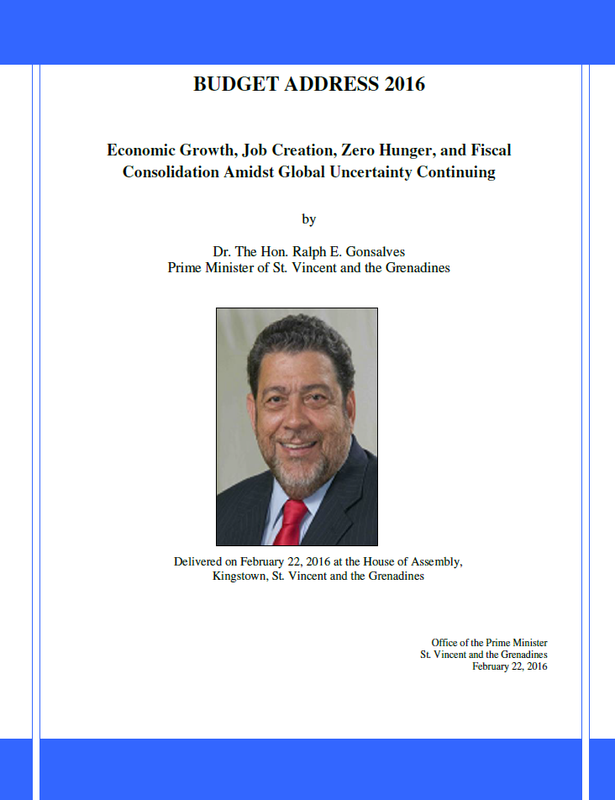 The Honourable Ralph E. Gonsalves, Prime Minister and Minister of Finance. 28 January 2015. 2014 2014 Budget Address: Strengthening the Socio-Economic Base for Recovry and Reconstruction after a Natural Disaster in a Context of On-going Global Economic Uncertainty and Downside Risks. Delivered by Dr. 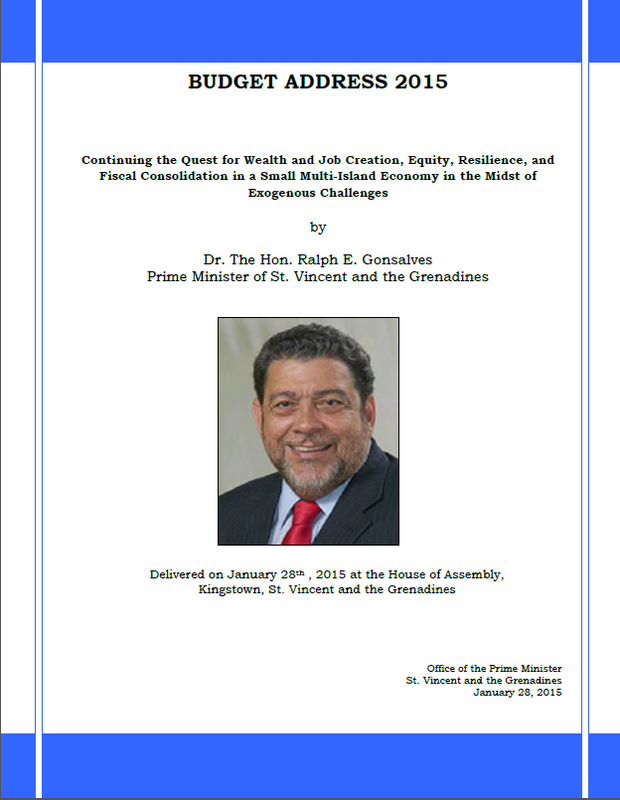 The Honourable Ralph E. Gonsalves, Prime Minister and Minister of Finance. 20 January 2014. 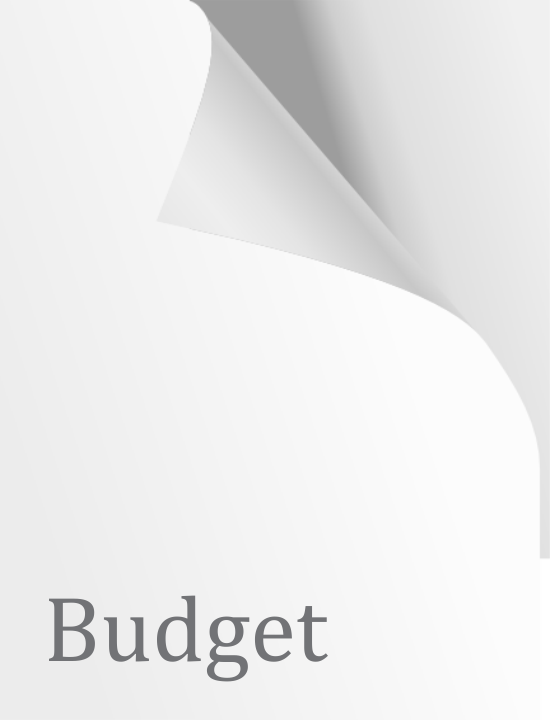 2013 2013 Budget Address: Building a Sustainable, Resilient Economy in Challenging Times. Delivered by Dr. The Honourable Ralph E. Gonsalves, Prime Minister and Minister of Finance. 15 January 2013. 2012 2012 Budget Address: Job Creation, Economic Growth, Financial Stabilisation, Fiscal Re-balancing, and Social Equity at a Time of Continued Global Economic Uncertainty. Delivered by Dr. The Honourable Ralph E. Gonsalves, Prime Minister and Minister of Finance. 13 December 2011. 2011 2011 Budget Address: Fiscal And Financial Stabilisation, Job Creation, Wealth Creation, and Social Safety at the Tail-End of the Recession. Delivered by Dr. The Honourable Ralph E. Gonsalves, Prime Minister and Minister of Finance. 24 January 2011. 2010 2010 Budget Address: Economic And Financial Stability, Social Cohesion and Fiscal Consolidation at a Time of Global Recession and Uneven Recovery. Delivered by Dr. The Honourable Ralph E. Gonsalves, Prime Minister and Minister of Finance. December 2009. 2009 2009 Budget Address: Socio-Economic Development, Competitiveness, and Fiscal Consolidation at a Time of Financial Turmoil and Economic Uncertainty Internationally. Delivered by Dr. 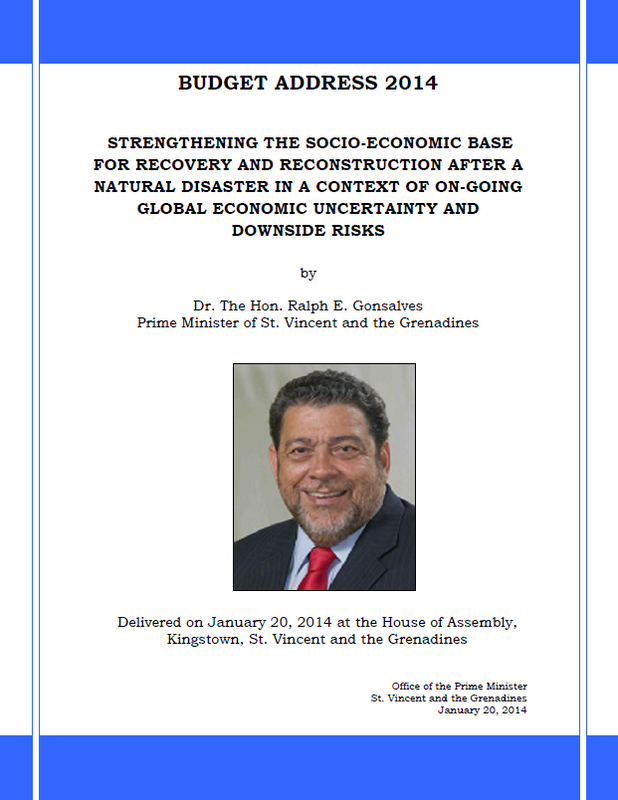 The Honourable Ralph E. Gonsalves, Prime Minister and Minister of Finance. 1 December 2008. 2008 2008 Budget Address: Meeting The Global And Domestic Challenges - The Quest To Build A Modern, Many-Sided, Competitive, Post-Colonial Economy Which is National and Regional. Delivered by Dr. The Honourable Ralph E. Gonsalves, Prime Minister and Minister of Finance. 10 December 2007. 2007 2007 Budget Address: On the Cusp of Advanced Economic Take-Off: Further Fiscal Consolidation And Tax Reform. Delivered by Dr. The Hon. Ralph E. Gonsalves, Prime Minister and Minister of Finance. 11 December 2006. 2006 2006 Budget Address. Delivered by Dr. The Honourable Ralph Gonsalves, Prime Minister and Minister of Finance. 23 January 2006. 2005 2005 Budget Address. Delivered by Dr. The Honourable Ralph Gonsalves, Prime Minister and Minister of Finance. 6 December 2004. 2004 2004 Budget Address. Presented by Dr. the Hon. Ralph Gonsalves, Prime Minister and Minister of Finance. 1 December 2003.